The central object of our study is a certain class of infinite-dimensional Lie algebras alternatively known as contragredient Lie algebras, generalized Cartan matrix Lie algebras or Kac-Moody algebras. 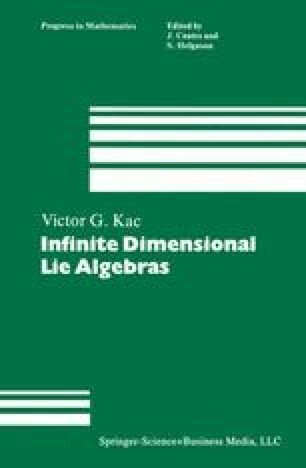 Their definition is a rather straightforward “infinite-dimensional” generalization of the definition of semisimple Lie algebras via the Cartan matrix and Chevalley generators. The slight technical difficulty that occurs in the case det A = 0 is handled by introducing the “realization” in the “Cartan subalgebra” h. The Lie algebra o(A) is then a quotient of the Lie algebra õ(A) with generators e i , f i and h, and defining relations (1.2.1), by the maximal ideal intersecting h trivially. Some of the advantages of this definition as compared to the one given in the introduction, as we will see, are as follows: the definition of roots and weights is natural; the Weyl group acts on a nice convex cone; the characters have a nice region of convergence.